We explore the effects of alignment interactions on the macroscopic behavior on models for confluent tissue, and find that alignment can promote solidification, as well as supporting a new flocking fluid state. A second approach is to recognize that some cells have been observed to move in the direction of lower shear stiffness. Since vertex models exhibit a direct correlation between cell shape and shear stiffness, this could lead to a new type of coupling between cell shape and polarization and we propose this as an additional mechanism via which cells can communicate mechanically and coordinate motion. 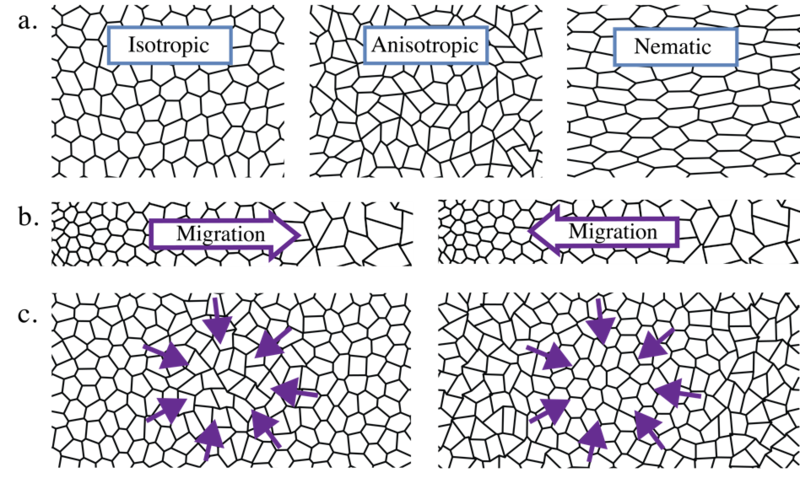 Using a simple landau phi-4 theory that captures the fluid solid transition seen in vertex models, we develop a hydrodynamic theory that couples cell anisotropy to polarization and use linear stability and numerical integration to demonstrate that the emergence of patterns in the tissue depends strongly on how tissue cells respond to tissue stress gradients. Manning group participants: Michael Czajkowski, Max Dapeng Bi.